ToG vs ToC | The Old Adam Lives! This is from a few years ago at the height of ‘The Purpose Driven Life’ stuff. Summary: Although the book The Purpose Driven Life (TP DL) begins well by insisting the purpose of life is not about man but rather God, author Rick Warren devotes the entire book on how to improve the spiritual life of people, similar to any self-help book. Rather than emphasizing the Gospel of Jesus Christ and what God has accomplished in His Son, Warren presents over 160 legalistic rules by which men can obtain and live a victorious “purpose-driven” Christian life. In reality, TPDL offers nothing more than the repetition of ancient heresies and false teachings which sparked the 16th century Reformation. St Paul addressed similar heresies when he wrote his letter to the Galatians and which have continued to plague the Christian faith throughout history. The book is written from an Arminian or semi-Pelagian theological viewpoint, rather than orthodox Christianity as found in the bible. The author illustrates the system of theology known as Theology of Glory(TG), which is the exact opposite of the Christocentric system referred to as Theology of the Cross(TC). The bible is centered in the works of God as shown in the perfect life, death, and resurrection of His Son Jesus Christ, not the works of man. However, author Rick Warren devotes his entire treatise on convincing readers that they need to perform good works in order to ensure their status in heaven. Warren maintains that all men have free will and our acceptance by God is based upon our choices and obedience to God’s will. This is a throwback to the heresies of Medieval Roman Catholicism confronted by Martin Luther. Readers of TPDL are not pointed to Christ as their Righteousness, but instead are directed to dedicating themselves to “40 days of purpose”. One of the most popular books in Christian bookstores is The Purpose Driven Life (TPDL) by author Rick Warren, pastor of Saddleback Community Church in Lake Forest, California. 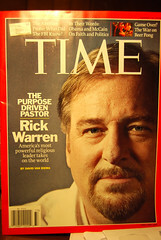 Even secular authorities, including President George Bush, have praised the insights of author Rick Warren. Many news reporters have seen fit to interview this highly successful writer. After all, TPDL has sold upwards of 25 million copies worldwide, an incredible accomplishment by any standard. I will attempt to provide insights as to why this book is so successful and whether it is in conflict or harmony with basic Christian doctrine as found in the Scriptures, as rediscovered during the 16th century Reformation in Germany. O foolish Galatians! Who has bewitched you? It was before your eyes that Jesus Christ was publicly portrayed as crucified. Let me ask you only this: Did you receive the Spirit by works of the law or by hearing with faith? Are you so foolish? Having begun by the Spirit, are you now being perfected by the flesh? I thought Mr. Marron did a nice job of explaining the theology of glory as opposed to the theology of the cross vis-a-vis Rick Warren’s book. Have you read the book? Do you think this article was a fair critique? Thanks to Pastor Pat Thurmer for sending me the article.